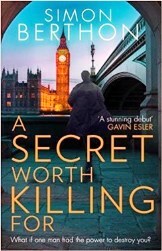 Not a serial killer novel – thank goodness, but a series of kills certainly lies at the heart of this thriller. Anne-Marie Gallagher, a former lawyer, has risen to the dizzy height of UK Minister of State for Security. She’s done well, is tough and has worked hard, and is now a face to be reckoned with, possibly a future leader. Maire Anne McCartney, on the other hand, a law student, grew up in a house of secrets in the 1990s. Maire had a lover and a brother, both members of a team of vicious IRA killers known as the ‘Gang of Four’. When her lover, Joseph, suggests he and Martin, her brother, want her to get close to a British Special Branch officer, and ‘do whatever it takes’ to get him to a location so he can be interrogated, she resists, because she knows what that might entail. Joseph promises there will be no violence that they ‘just want to chat’. She recalls sharing in Martin’s pleasure when the IRA blew up Margaret Thatcher’s hotel in Brighton, and feels the need to not betray her community. As Joseph puts it, ‘now you’re eighteen, grown up… you’ve got responsibilities.’ Under this pressure, she agrees to do as they ask. The SB officer is taken and, of course, dies. Subsequently, her brother, Martin, along with Joseph and the two other members of the ‘Gang of Four’, disappear off the province’s radar. The problem is, Anne-Marie Gallagher, UK Minister of State, and Maire Anne McCartney, are one and the same person. For Anne-Marie is a reinvention - a reformed name, face and persona from a troubled past deep in the oppressive and depressive battleground that was 1991 in Northern Ireland, where your background counted for and/or against you, where doors were knocked in the middle of the night, where people disappeared without explanation or trace, where suspicion, once raised, never goes away. Unfortunately for her, past secrets will always catch up with you – even those buried deep in the soil of the Province. When a call using a 25-year-old code comes in reporting the location of a body, DCI Jon Carne cannot help but begin tracing the origins of the corpse… and who might have placed it there. This presents a double jeopardy for Anne-Marie, because she once had another lover after Joseph, an English student named David. He had a strangely vague background, too – and he also disappeared. At the heart of the story is loyalty, betrayal, political self-interest, vaguely-imagined but never-admitted love, where nothing and nobody is what they seem, where promises are as casual as pulling a trigger or signing a piece of paper. DCI Carne, set on a relentless path to uncover secrets that lie in Westminster, in the shadowy corridors of MI6 and MI6 just as much as in the equally dark corners of Derry, Antrim or Dublin, finds himself delving into places that could cost him his career… or his life. The names and descriptions of certain key ‘players’ are not a million miles away from some of those still living (and one recently deceased). The writing is fluid, as one would expect from a journalist, historian and film-maker. The tension is real, demanding the turning of the next page, and the characters don’t so much as leap off the page but emerge like something dark, unsettling and threatening, staying with you long after reading. My only bug with this book, which persists still, is how, in this day and age of computers, facial recognition systems, files and folders on everyone, how the sister of a known IRA killer, lover of another and lover of a ‘disappeared’ British student in Dublin, comes to be British Minister of State for Security without anyone recognising her or having conducted a very close background check. Get over that, and it’s still a very good read.